At Grant Roofing & Pressure Washing, we use state-of-the-art commercial pressure washers and tools that can tackle any sized job! Pressure washing your driveway is the easiest and quickest way to remove moss, algae and mildew which can be slippery and dangerous. We make sure your landscaping is safe and returned to its original condition after completing any job. Pressure washing is one of the easiest ways to add both curb appeal and value to your home. We have great relationships with several of the local real estate agents in the area that utilize our services before they list a home. We survey each job individually and make a decision on the best way to clean it. For example, we do not clean concrete or asphalt the same way we clean a wood or vinyl deck. We change the pressure to make sure we do not cause any damage to the surface or surroundings. We can use cold or hot water, different cleaning products and an assortment of tools and tips to achieve the best results. Whether you're a homeowner faced with dingy vinyl siding or a business owner dealing with a vandalized storefront, professional pressure washing can help remediate a wide range of issues. At Grant Roofing & Pressure Washing, our team is experienced in carrying out pressure washing for a wide variety of customers and building types across the Portland, Vancouver and Western Washington areas. Our licensed, bonded and insured technicians are capable of handling any exterior cleaning job, big or small. Over time, dirt, mold, mildew and other contaminants can build up on the exterior of your home. These pollutants can degrade your home's siding, reducing your curb appeal and lowering your property values. Many homeowners are reluctant to use pressure washing to clean their siding due to concerns about potential damage. Luckily, a safe and effective alternative exists to high-power pressure washing. At Grant Roofing & Pressure Washing, our team specializes in soft washing for a variety of siding surfaces such as vinyl, brick, stucco, wood and aluminum. 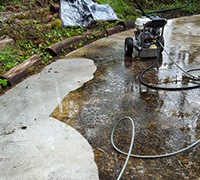 This technique utilizes low-pressure power washing in combination with safe and biodegradable cleansers. Together, this method thoroughly, yet gently, removes dirt, moss, mold, pollen and algae and eliminates stains without causing any damage to your home or impacting your surrounding landscaping. 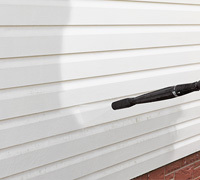 Regular soft washing performed by our skilled technicians can help maintain the exterior of your home and prevent the need for costly repair or replacement of your siding. Graffiti can create a negative impression about your place of business, turning away customers, reducing your property values and costing you revenue. Unfortunately, as many commercial property owners discover when vandals deface their buildings, graffiti can be exceedingly difficult to remove. At Grant Roofing & Pressure Washing, our graffiti removal team uses state-of-the-art equipment to remove graffiti quickly and efficiently, returning your building to its original state and preventing any permanent damage. All of our technicians are well trained in power washing, ensuring that the appropriate temperature and pressure are used to remove paint, ink or any other pollutants. Do-it-yourself graffiti removal solutions can make the problem even worse by etching the defaced surface. Our team of professionals can fully restore your commercial building, allowing you to get back to business as usual. As any multi-family property manager or owner knows, keeping your buildings in top condition is key to retaining current tenants and attracting new ones. Pressure washing can help keep your multi-family complex looking its best by removing visible dirt as well as ensuring the longevity of your buildings by removing potentially corrosive contaminants. 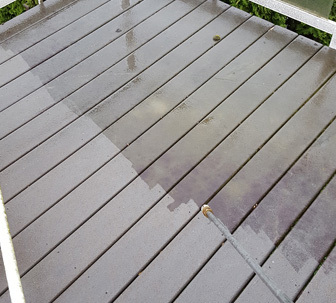 At Grant Roofing & Pressure Washing, our pressure washing team has the expertise necessary to handle the exterior cleaning of all surfaces at your multi-family property. From cleaning oil leaks in your parking garage that can pose a safety risk to your residents to removing mold that can contribute to the deterioration of your building's siding, our expert technicians understand the appropriate technique to use for each and every surface. With an emphasis on efficiency, our team can have your multi-family complex looking like new in no time. Whatever your cleaning needs may be, Grant Roofing & Pressure Washing has you covered! Contact us today to schedule a free estimate or to discuss your pressure washing, soft washing, or graffiti removal options. There’s no job too big for our team!